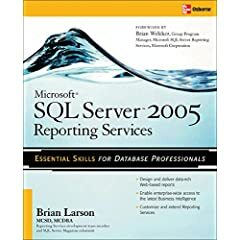 This excerpt from Chapter 5 of the book Microsoft SQL Server 2005 Reporting Services 2005 explains how to create reports to satisfy business needs using Transport List. In Chapter 4, you built your first reports using the Report Wizard. This is like learning to ride your first two-wheeler with the training wheels on. Now it is time for the training wheels to come off, so you can see what this baby can really do! We are going to begin building reports from scratch. We hope these next few chapters provide the handholding you need, and then you can learn to ride sans training wheels without getting skinned knees. First, we work with the two types of reports you were introduced to in Chapter 4. We begin by building a table report without the use of the Report Wizard. From there, we do the same with a matrix report. After that, we look at two new report types—the chart report and the list report. We end the chapter by working with some of the basic report items that make up each report—namely, the line control, the text box control, and the rectangle control. Along the way, you learn more about the Report Designer that serves as our development platform. So, the training wheels are off and the wrenches have been put away. Don your helmets; it's time to ride! We cover some familiar territory as we begin building reports without the Report Wizard. In Chapter 4, you used the Report Wizard to create table reports (the Customer List Report and the Customer-Invoice Report) and matrix reports (the Invoice-Batch Number Report). We create these types of reports once more but, this time, without the aid of the wizard. Again, we look at the business needs of Galactic Delivery Services (GDS) and create reports to satisfy those business needs. Business Need The transport maintenance department at Galactic Delivery Services needs a list of all the transports currently in service. They want this list to be grouped by transport type. The list includes the serial number, the purchase date, and the date the transport was last in for repairs. The list also includes the cargo capacity and range of each transport type. Run the Business Intelligence Development Studio or Visual Studio 2005. The Start page is displayed (or select File | Close Project from the menu if a solution is already open). Type Chapter05 for the project name. This project will contain all the reports you create in this chapter. Click Browse to open the Project Location dialog box. Click My Projects to go to the Visual Studio Projects folder. In the list of folders, double-click the MSSQLRS folder. Click OK in the New Project dialog box. A new project is created. In the Solution Explorer on the right side of the screen, right-click the Shared Data Sources folder. Select Add New Data Source from the Context menu, as shown here. Type Galactic for Name. Click Edit. The Connection Properties dialog appears. Type the name of the Microsoft SQL Server database server hosting the Galactic database or select it from the drop-down list. If the Galactic database is hosted by the computer you are currently working on, you may type (local) for the server name. Click the Use SQL Server Authentication radio button. Type GalacticReporting for the user name. Type gds for the password. Click the Save My Password check box. Select Galactic from the Select the Database on the Server drop-down list. Click Test Connection. If the message Test Connection Succeeded appears, click OK. If an error message appears, make sure the name of your database server, the user name, the password, and the database are entered properly. If your test connection still does not succeed, make sure you have correctly installed the Galactic database. Click OK to exit the Connection Properties dialog box. Click OK again to exit the Shared Data Source dialog box. A new shared data source called Galactic.rds is created in the Chapter05 project. In the Solution Explorer, right-click the Reports folder. Put your mouse pointer over Add in the Context menu and wait for the submenu to appear. Select the New Item command from the Context menu, as shown here. The Add New Item - Chapter05 dialog box appears. Make sure the Report icon is selected in the Templates area. Enter TransportList for the name. Click Add. A new report called TransportList.rdl is created in the Chapter05 project. You are taken to the Data tab of this new report. Enter TransportList for the dataset's name in the Dataset dialog box. The dataset name must not contain any spaces. Task Notes Because we are creating several reports in the Chapter05 project, all of which select data from the Galactic database, we began by creating a shared data source. This saves us time as we create each of the reports. We continue this practice throughout the remaining chapters. In Steps 20 and 21, we are adding a report to the project. In Chapter 4, you saw that selecting Add New Report from the Context menu causes the new report to be created with the Report Wizard. In this chapter, we are looking to build our reports from scratch, which is why we used Add New Item in Step 21. Click the Generic Query Designer button in the Data tab toolbar as shown in the following illustration. This unselects the Generic Query Designer and switches to the Graphical Query Designer.